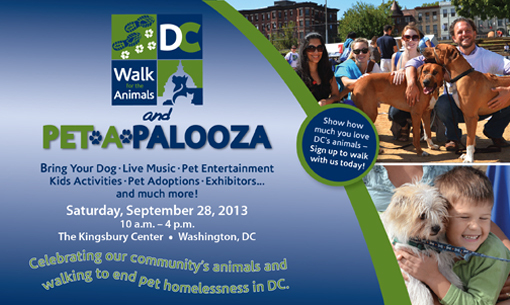 On Saturday, Sept. 28, bring your dog to the Kingsbury Center in downtown DC for a fundraising walk, pet entertainment, live music, kids activities, pet adoptions, exhibitors and more. The event runs from 10:00 a.m. to 4:00 p.m. and benefits the Washington Humane Society. Will Thomas, television news anchor for Fox 5, is the event emcee. At noon, there is a 1 mile walk. Participants can register as individuals or as part of a fundraising team. Walk registration is $20 per adult, $15 for youth 12 and under. The Kingsbury Center is at 5000 14th St. NW, Washington, DC 20011. From 5:00 to 7:00 p.m. on Sept. 28 Zoom Room Rockville is hosting a Yappy Hour fundraiser for Lucky Dog Animal Rescue. Zoom Room will donate 15% of ALL SALES — including retail and group classes — for September 28th to Lucky Dog and will have refreshments, Zoom Room’s doggy donuts, our famous Doggy Disco®, silent auction and more!